The fear is that with so many local and Pan-European schemes live, there could be a risk of them not talking to each other, exacerbated by the fact that most of the individual schemes require a local settlement account. From a treasury perspective, fragmentation of the liquidity – and that liquidity being regulated by different standards – culminates in a nightmarish difficulty in keeping the bank’s liquidity position. Last but by no means least, all these technical settlement accounts are outside of the RTGS (real-time gross settlement) jurisdiction, and even though it is possible to fund/defund them during the RTGS open hours, it is not possible to have the liquidity outside of the RTGS system. This causes a loss of remuneration and problems with the reserve requirements. The solution that TIPS offers alleviates fragmentation and enables the treasurer to forward the RTGS liquidity to TIPS; therefore, by having one central point, it mitigates the risk of running out of liquidity. This avoids transactions being declined, which is a reputational risk that may lead to customers switching to more reliable competitors. If that wasn’t serious enough, banks also risk a heavy fine from the regulator, which may have the catastrophic consequence of the revocation of the bank’s licence. With the TIPS initiative, the ECB is facilitating the closure of the local technical settlement accounts in order to concentrate the settlement layer in one single account in a central bank. This will be Euro-based at the outset, with multiple currencies due to be rolled out in the second phase. In short, TIPS allows financial institutions to mitigate the liquidity risk, concentrate their liquidity in one single point – the TIPS DCA account – whilst still being a part of the RTGS system and adhering to the strict reserve requirements. It is a win-win scenario for treasurers and, as you and I know, it is the hero treasurers who can find that fine balance of keeping just enough back to cover demand and investing the rest, creating a clear revenue stream. However, back to the key aspiration of ‘Interoperability’ and how TIPS will have an impact. Potentially every owner of a Target 2 account can open a TIPS DCA account and it is no coincidence that most banks in Europe have one. Also, there are options for non-banks to connect to a Target 2 account, meaning an expansion into the world of retail, which is reflective of how the European payment ecosystem is changing. 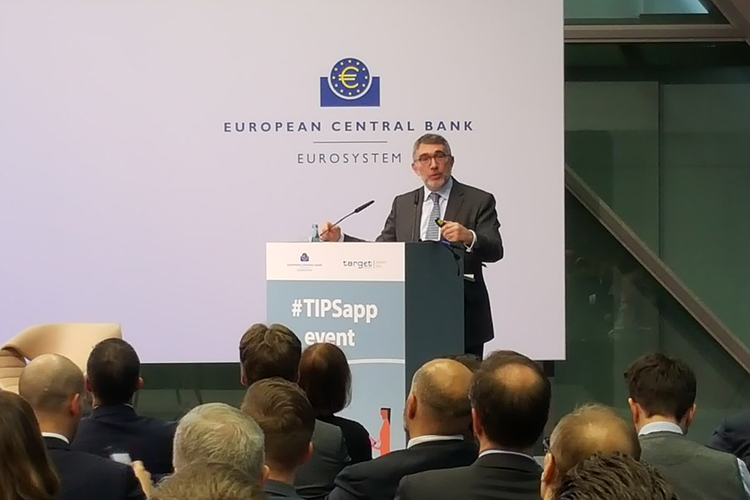 Whilst a lot of mobile prototype applications were demonstrated at the ECB’s #TIPSapp Challenge Event, and all of them were well designed to satisfy the client requirements for TIPS integration, it was ACI that addressed a crucial point – it is all very well having a slick mobile app to connect to TIPS, but without a solution that enables you to connect seamlessly to the other schemes (RT1, STET and local schemes), you are always going to lose in the interoperability stakes. In fact, when the ECB asked what makes the ACI solution stand out, 48% of the 100+ voting audience noted interoperability and the convenience it brings. It was exciting to see the ECB TIPS team bringing the solution providers and financial institutions together at this event to work on a common objective; the success of the TIPS project and the realization of European reachability. I would like to thank the ECB for hosting this event, and I encourage financial institutions to ACT NOW on getting to grips with the complexities of real-time payments. The move toward real-time payments is global and adoption is accelerating. Existing solutions are expanding their reach and services, while new solutions are continuously coming to market. Regulators are throwing their weight behind real-time payments, non-bank competitors are eagerly embracing it, and consumers are candidly demanding it. And a quick hat tip to ACI’s pre-packed and pre-tested cloud solution– every size of financial institution can exploit the opportunities it offers and guarantee speed to market. If banks and financial institutions don’t move quickly, then they risk losing more than payment volumes; they risk losing their customers.